Yale University Press has released the “Interaction of Color” app for the iPad to celebrate the 50th anniversary of this iconic book. The new app explores Albers’s teachings through interactive plates that allow users to perform their own experiments with color. The plates are designed to reproduce the experience of working with cut and colored paper and the shapes can be manipulated to see how colors look different on different grounds. The app includes the full text of The Interaction of Color and over 125 of the original color studies. 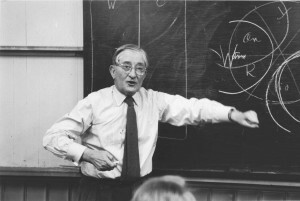 It also includes archival videos of Josef Albers teaching at Yale. A free version of The Interaction of Color app is available from the itunes store, it allows you to sample Chapter 10 and includes two interactive plates and the palette tool. The full version is available as an in-app purchase for $9.99. The Interaction of Color website includes further information, a sampler of video commentary, and a demonstration video.